After a postponement due to some forecasted stormy weather, our annual Killer Pumpkin Fest returns to Green Dragon on Saturday, October 29th. Celebrating all things pumpkins, this daylong event will take place inside and out in front of Green Dragon from 11:00am to Midnight. 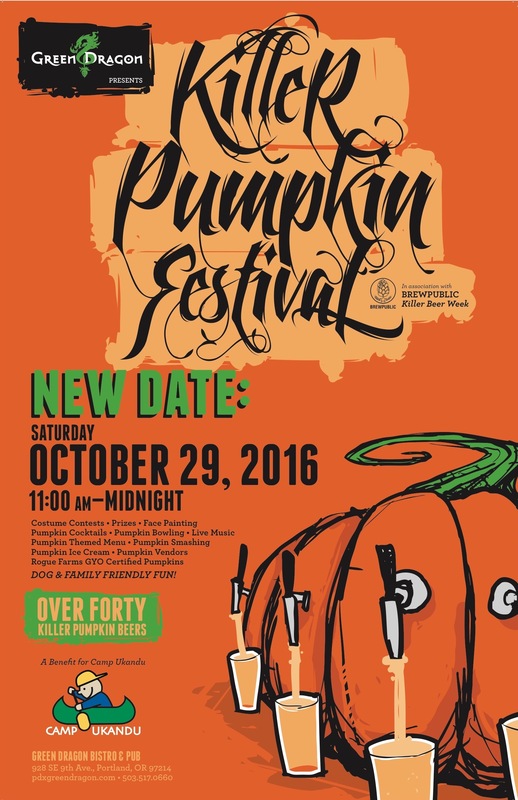 The highlight of the day of course is pumpkin beer as 40 or so pumpkin beers and ciders will be pouring throughout the day. All offerings will be available in sample size or full pours. Then at 5:00pm, Elysian Brewing will tap its giant gourd filled beer outside for all nearby to enjoy. Beyond the pumpkin beer, Green Dragon will be serving up pumpkin cocktails, pumpkin spiced soda, pumpkin foodie treats, the beloved pumpkin smashing festivities, costume contests for kids, adults and dogs. This daytime family friendly event will also include pumpkin carving and decorating all from pumpkins grown at Rogue Farms. Vendors include Cycle Dog, Coco Donuts, Ruby Jewel, One Tail at a Time, face painting, and more. Here are the times for all of the special events during this kid and dog friendly day. When it comes to pumpkin beers and ciders, plan accordingly as there will be 40 or so pouring on Saturday. Remember that Elysian Brewing will be tapping its giant gourd filled with one of its beers at 5:00pm! Elysian – Gourdfather Pumpkin Barleywine 11.2% ABV. Suggested donation of $5.00 at the door to benefit CAMP UKANDU.